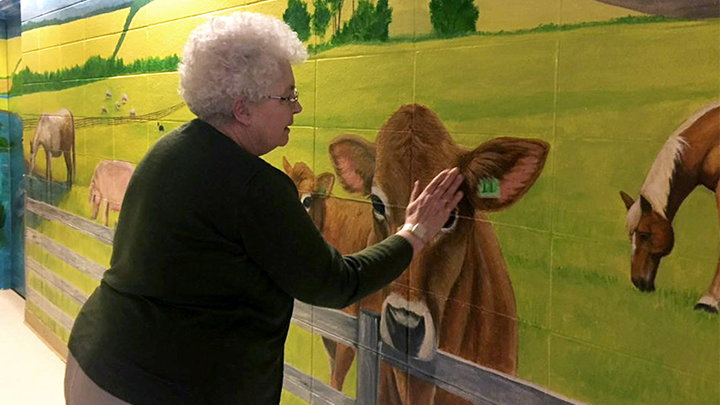 Betty Gelderman, a resident at Barrhead Continuing Care, says she enjoys the animals on the new wall mural at her site, created by local artist Tammy Taylor, which depicts a traditional farm homestead. BARRHEAD — There’s a quaint farmhouse and barn here, with a barnyard full of cows, horse, sow, piglets, chickens and sheep. A stream runs through golden fields, where antique farm equipment reminds us of years gone by. It’s all thanks to artist Tammy Taylor, who envisioned the appealing homestead as a mural for residents to enjoy at the Barrhead Continuing Care Centre. The attractive mural has generated interest and positive comments among residents, families and staff alike. “I sit at a desk nearby and there’s a lot of conversation about how it has enhanced our unit,” says Sandy Rauscher, Care Manager at the Alberta Health Services (AHS) centre. Rauscher says she’d been looking for ways to engage older residents and brighten up the facility. While she already knew Taylor through her work as an onsite hair stylist, she hadn’t realized what an accomplished artist she was until a few of her coworkers shared how much they thoroughly enjoyed themselves at a paint-night, with Taylor as their instructor. When approached to paint a mural, Taylor agreed to take on the project, and provided a preliminary sketch of a farm scene set in the Barrhead region, says Jenny Nanninga, AHS Seniors Health Manager for the area, who also saw the opportunity to bring a few community partners on board. “I approached two equipment dealerships here in Barrhead and asked them if they’d like to be involved, as a thank-you to some of their former customers now in continuing care,” says Nanninga. A John Deere tractor and plow, a vintage Versatile tractor and a Vermeer baler number among the images on the wall. Residents were also invited to share their feedback throughout the creative process, with many of their ideas now appearing in the finished artwork. Residents often pause by the wall to chat about their own farm memories. Some even pet the realistic animals. Taylor says it’s wonderful to see them so invested in the project and the images of memories so near and dear to their hearts. Other departments, including maintenance and housekeeping, became involved and supported the project by preparing the wall for painting. Rauscher and Nanninga agree the mural has become more than just a piece of wall art.